The ABQ BioPark is a fun and dynamic place for students to have field experiences and learn outside the classroom. Note: If your group plans to visit both the Zoo and the Aquarium/ Botanic Garden, please complete a separate form for each location. 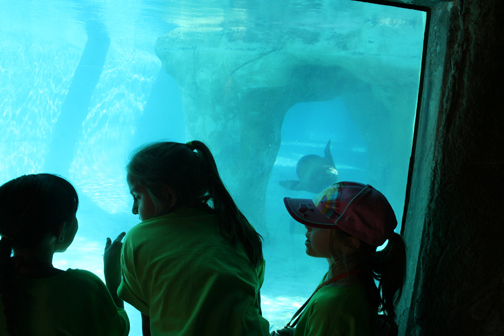 School group discounts are available on weekdays during the school year from Labor Day through Memorial Day. For summer, please see Recreation Group Discounts. Please note that each home school will need to fill out the form, Notification of Establishment of a Home School, and then call 505-764-6272. Groups must consist of at least 10 students and 2 adults. There must be at least one adult chaperone per five students. Up to three adults per five children are eligible for School Group Admission Pricing. Additional adults are eligible for Group Discounts. Call if your group includes Pre-K or if you have students that require additional accommodations. We accept cash, check, purchase orders, Visa, MasterCard, American Express and Discover. Payment may be made up to a week before the visit. To cancel a field trip, call 505-764-6272 at least 72 hours before your scheduled visit. Reservations must be made at least two weeks in advance to receive the group discount. School field trips are scheduled only on weekdays. Schools can find group-friendly accommodation rates at nearby Old Town hotels. The Best Western Plus Rio Grande Inn, a sponsor of the BioPark, is conveniently located and offers discounted rates for school groups visiting Albuquerque for a trip to the Zoo, Aquarium or Botanic Garden.